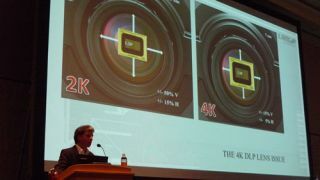 4K will be a hot topic at InfoComm 2013 in Orlando when the show floor opens on Wednesday, but a special 4K session at the InfoComm Projection Summit on Monday kicked off this week’s look at one of the most interesting new stages in the evolution of video projection at the high end. “The 4K Opportunity” session took place Monday afternoon, with moderator David Keene, executive editor at NewBay Media, leading a trio of top industry experts examining where and why 4K projectors will open up further growth opportunities in the market. Markus Ries, Director of the Lang Academy, pointed out that a 4K bottleneck in the AV staging world is that legacy DLP projector lenses were made for 2K– causing horizontal and vertical shift range issues when used on a 4K projector.The slate of presenters– Markus Ries, Director of the Lang Academy; Sander Phipps, Product Manager, Sony Professional Display Division; and Guy Van Wijmeersch, Global Product Marketing Director at Barco, looked at important issues like 4K signal management, differing needs and opportunities of the staging vs. installed AV vs. simulation markets, and how legacy lens inventories affect 4K adoption. Keene led off the discussion explaining that in the staging world– and in the installed AV such as sports arenas, and even large-scale digital signage, you have been able to do 4K for years, by either by edge-blending or tiling multiple display devices– or with a lot of LED wall real estate. But that single-display, small display resolution milestones are important, and the cinema market’s pioneering of 4K will now push the technology into the installed AV, very large-scale digital signage, and AV staging worlds. Markus Reis brought his experience as a top supplier of gear to the high end staging market in Europe, explaining that a staging company can reduce cost with 4K, by using one 4K projector and not needing to blend several 2K projectors. He also emphasized that a lot of the benefit of using 4K is that it lets you do 2K better. Reis did point out that a bottleneck is that nearly all lenses for the big DLP projectors out there in use today, were made for 2K– for the 1.26 inch DLP chip specifically. The problem is that both the vertical and horizontal shift range is reduced a lot if you now put that same lens on a 4K projector with a 1.38 inch DLP chip. (The DLP part of the digital cinema market largely did not choose to upgrade lenses when some of them moved to 4K, because of the expense.) “4K, with the old lenses, is ‘good enough for cinema’, but not good enough for Porsche, Mercedes, and those type of companies that want to do live events with nothing but the best technology,” said Reis. Sander Phipps, of Sony, pointed out in his presentation that we’ve learned a lot from the consumer side, where 4K is coming in fast. The software/hardware to upscale 2K content to 4K is now good, with HDMI 2.0 coming soon to help on the connectivity side. There are many HDMI skeptics about, because the new HDMI standard has been promised but not delivered for a while, but even a new HDMI won’t be good enough for the kind of higher bandwidth 4K that broadcast TV needs in a robust workflow, or for what the staging and simulation industries need.